Weighted vests make exercises such as push ups, walking, jogging and playing sports more challenging. Vests can weigh as little 5 pounds or they can exceed 80 pounds. You can adjust most weighted vests by adding or removing metal ingots from the pockets. 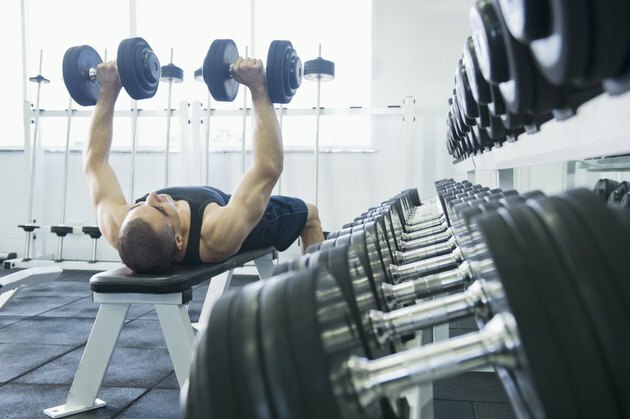 This allows you to gradually increase the weight of your vest as you get fitter and stronger. The military, law enforcement agencies, fire fighters, athletes and fitness enthusiasts all use weighted vests. Weighted vests can be used to simulate wearing body armor or firefighting equipment to develop job-specific fitness or just to make playing sports more demanding. Some athletes use weighted vests to increase their strength for running and jumping. Although weight vests are an accepted tool for increasing your fitness and strength, they also present an increased potential for injury. Weighted vests sit on your shoulders and are fastened around your waist. Your spinal column, which consists of 33 vertebra and intervertebral discs, supports this weught. The added weight provided by the vest may lead to compression of your intervertebral discs, which is a reduction in the spaces between vertebrae. Compressing intervertebral discs can lead to back pain and as well as injury. To reduce your risk of suffering a compression-related injury, avoid high-impact activities. Jumping and running place a significant impact through your spine, even when you are not wearing a weighted vest. Running and jumping while wearing a weight vest may be a necessary risk of you are training for competitive sports or the military but if you are working out for general fitness and health, the risks of serious back injury outweigh any potential benefits. Normally your center of mass is directly over your base of support. That is to say that your weight is over, or very close to, your spine. This means that very little muscle tension is required to keep you upright. A weighted vest, especially a heavily loaded one, will move your center of mass away from your base of support and subsequently place an additional load on your muscles. If this load is uneven this can result in a lot of stress on the muscles on the opposite side of the load. If the weight is located on the front of your body, your back muscles will have to work overtime and the muscles of your abdomen will be required to work harder than normal if the load in on your back. Either scenario places your spine in a mechanically difficult position which could result in injury. To get the most out of your weighted vest while minimizing your risk of injury, you should always ensure that the weight is distributed evenly between the front and the back. Failure to do so significantly increases your risk of injury. Also ensure the weight is distributed evenly from left to right to avoid any lateral stresses. If your weight vest has a waist belt, ensure that it's secured tightly to keep the weight as close to your body as possible.